Who’s the newest college graduate on the block? …aaaand then I open my eyes and find myself at the workplace. Nonetheless, it was really great to have my brother, his new wife, my mom and Will there to celebrate with me, and to also snap photos as I awkwardly tried to make the most of my photoshoot in front of the raincloud of death. not to mention my equally awkward graduation gown sleeves. But even with all of the awkwardness, I’m truly one blessed lady. Not only to have graduated, but to have done so with the support of my family. If it weren’t for the continuous encouragement from my mother, I would’ve undoubtedly scurried back home my freshman year when the changes seemed too overwhelming to handle, or my sophomore year when the classes became too difficult, or my junior year when I realized that I actually had no idea what I wanted to do with my life at all. Alas, I made it. Although I still don’t know with 100% certainty where I’m headed or where I’m going to be in a few years, I do know that there’s a method behind all of this madness. Aside from the ceremony this weekend, we all had a pretty great time going out to eat at some of our favorite Orlando hot spots, experiencing me eating red meat again for the first time in 10 years (more on that later), and celebrating Will & my 1 and a half year “month-i-versary”. I know I know, I’m just so cool. 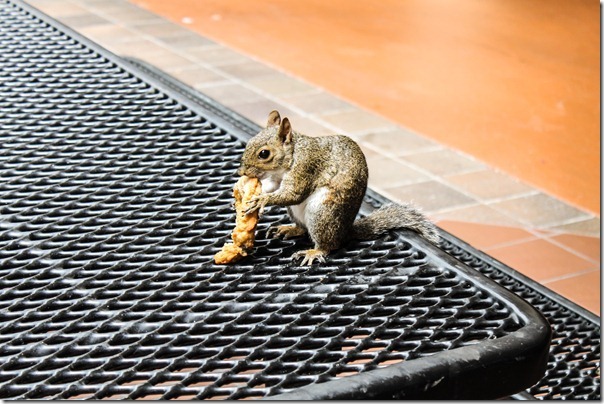 Almost as cool as this squirrel that we caught eating a fried chicken breast on the UCF campus. A bit to think about: What was the highlight of your weekend?